Oh, I have so much to share with you in the days and weeks ahead (and months!) We're here, in Copenhagen, nearly two weeks, and leaving to go back home Thursday morning. Our suitcases are packed, as tomorrow will be filled with two different family outings, maybe one more quick stop at a kitchen showroom, and somehow we have to pack the two paintings I bought! Copenhagen is truly one of the design capitals of the world. To have two weeks to observe great design in shops, in public spaces, and in private homes, has been a constant source of education, enjoyment, and privilege. I've also been inspired by learning new ways of thinking about protecting our natural resources and changing the way we live in small ways. Danes are famous for subtle, but pointed, humor, and perhaps you will see this characteristic in this special exhibit I will show you on thinking green, which is taking place at the Danish Design Center. Coming soon. So, having been in six of my family's kitchens this time around (that, not being all of them) and spending a lifetime of seeing these relatives only every few years, I can tell you that it struck me more than ever that our kitchens are a conduit to so much more than food, but to family togetherness, to sharing, to love. Kitchens are so incredibly important, wherever they are in the world and regardless of whoever is planning a meal for someone else, or for one's own nourishment as well. It's all good, isn't it? 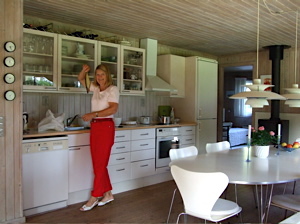 The image is of my cousin, Lis, showing me the smoked herring we will have for dinner!